I wanted to get in one final SOTA activation for the year, and planned on doing it the week between Christmas and New Year’s eve, but had come down with a nasty cold. Even though I still had a cold, I decided I’d do it on the very last day of the year. Having seen that Jeff, AA6XA discovered this hike could be done on public land, I couldn’t resist the opportunity to get this one done. It’s an exceedingly beautiful hike into an isolated part of the Diablo range. It’s right on the way to Mount Hamilton and Mount Copernicus. In fact, I would have done this earlier in combination with my Copernicus activation, if I thought I’d be able to squeeze both into a single day. The drive up is on mostly twisty road, with lots of elevation gained early on. The turnout at the fire station is quite large. As long as you don’t park in front of the fire station entrance, or the fire road that leads to the trailhead, it appears parking is allowed. This is where I parked. Parked and ready to hike! I’d be running APRS on this one, so any interested chasers could follow my progress up to the summit. My APRS setup is a bit complicated, with my HT, a Mobilinkd, and a spare Android phone I keep just for doing ham stuff. The nice thing about this configuration is that it’s very easy to interface with. But it’s definitely a lot of pieces compared to radios with APRS built in. So it took me a few minutes to get that going. But other than that, I was ready to hike! Starting out, the sun just barely up, so it was still a little bit dark. The hike starts out as an old road, following Smith Creek. After a little less than a half mile, the road crosses the creek. When I crossed, it was low enough to be crossed without wet feet, assuming some level of agility (I don’t have much). I’m guessing this creek gets quite a bit higher after rain and it may be better to investigate one of the routes talked about in Tom AI6CU’s blog post. After this crossing, the road gets pretty faint in places. I was mostly able to follow it though, with only occasional references to my map. There’s another stream crossing just before the trail starts really climbing. I believe this is Sulfur Creek. I didn’t know the name of it at the time, but the smell gave it away. This creek could possibly still be crossed without issue after rain. The road/trail does keep following Smith Creek for a while, but eventually takes a turn up the hill. This is when the views really start to open up, and when the calories really start burning. It’s a steady climb, with occasional steep sections. The head cold I had was definitely slowing me down a bit, but not so much as to make life completely miserable. 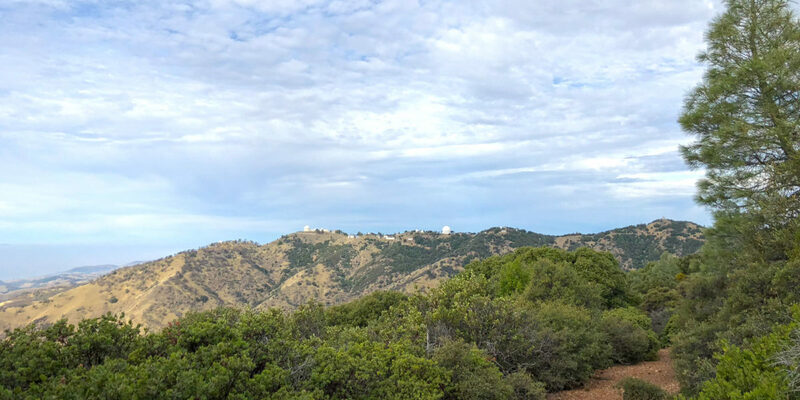 Just as the road/trail crests the ridge that leads to the summit, I got my first glimpse of the Lick Observatory on the ridge to the north. Here, it’s hard to tell where the road/trail goes, since it’s kinda wiped out by churned earth (do animals do that?). The road actually continues over this ridge and down into the next valley, but that’s not where you want to go. Instead, turn right and follow it up the ridge. As I followed the road up the ridge, more and more views appeared. Many of the major peaks around the south Bay Area were easy to see. There was a temperature inversion, so it got warmer as I climbed, and the air was clear above a layer of smog below. The road/trail is pretty easy to follow up here. And the actual summit starts coming into view. Nearing the summit, the cattle fence starts up, with the road/trail running along the left side of it. It’s a pretty old fence, with some of the trees having grown right through/around it. It’s also been repaired in several spots. Not long before having to cross to the other side of the fence, there’s a little picnic area. I’m not entirely sure how they got these picnic tables up there, but they’ve been there for quite some time. The trail keeps going along the fence, but eventually fades into the bushes. Right at this spot, there’s a gap in the bottom of the fence. It actually even has a carabiner that would allow opening it up, but I found I was able to get through by just taking my backpack off. On the other side of the fence, the road picks back up and is easily followed. Further along, there are a couple of spots where it’s necessary to push through some bushes, but these are short and easy enough. Reaching the summit, I found some trees had had a rough go of it. The only tall trees on the immediate summit were dead ones. The rest were shrubs just high enough to make it difficult to see the views. I changed my APRS comment to say “setting up for HF SOTA” and got to work. This one took a few tries. You’d think I’d learn from past activations that it’s bad to unwind your antenna wire among the twigs. My wire got caught and tangled more than once upon throwing. Keeping my cool and untangling it, I was able to get the wire thrown into the tree on the third or fourth try. It wasn’t super high, but it was high enough. I brought the wire over to my operating position and attached it to my squid pole to keep the near end about 6-8 feet off the ground. I switched my APRS comment to “HF SOTA Mount Isabel” or something similar. I didn’t seem to have good cell service, so I relied on my alert posted on SOTAWatch to get me spotted by way of RBNHole. It worked. Calling CQ on 20 meters, Mike VA6FUN up in Alberta came back to me quite promptly. I then proceeded to work my way through a pretty big pile of chasers. Some near, some far. After the calls stopped coming in for 20 meters, I switched over to 40 meters. I got two contacts there. I didn’t operate 30 meters this time. As I was packing up, I put out a call on 2-meter FM and got 4 more contacts there. One was over 100 miles away! The trip back down was pretty straightforward. I just went back the way I came. On my way up, I had paused and looked back several times, so the terrain would look familiar on the return trip.